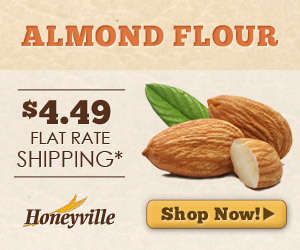 This is the best price you can get on my favorite almond flour from Honeyville Grains. 20% off is the deepest discount Honeyville offers, and it only comes around a few times each year. Use coupon code GIFT to get 20% off site wide, with a few minor exceptions (see website for details). Sale begins Monday, December 2nd and ends Friday, December 6th. I keep my box in our extra fridge downstairs, reserving about 10-12 cups in the pantry at room temperature. Almond Flour works best in recipes when allowed to reach room temp. For more info, recipes and tips for ordering, check out this post: Almond Flour: a GF girl’s best friend. Simply enter coupon code GIFT during checkout. Sale ends on Friday, the 6th of December. What will you make with your almond flour?